if we haven’t had enough crazy in our lives lately…I start a new job on Monday. For those of you who have worked with me in the past, you are probably thinking “didn’t you just start a new job?” and my answer would be “yep”. Last year, I left my field marketing position at a company I had worked with for 6 years to embark on a new role with a new company. At the time, I wasn’t necessarily unhappy at my job. I loved the team I worked with, I loved the franchisees I worked with, and I was super passionate about the brand and its direction. It’s a smart company led by smarter people. BUT, to advance we would have to be in Ann Arbor. And this SEC lovin, sunshine craving, Southern girl couldn’t do that again:) To grow I was going to have to leave. I came to that conclusion, but had yet to really start looking when a recruiter called. Almost a year later, I sit about to make another change in my career. Prior to this job, I spent 6 of my 12 years at one brand and the previous 6 at another. I’m not big on jumping jobs. I’m not big on jumping in general…ask my personal trainer about days she brought out the jump rope. BUT, I was leaving work unhappy. I was mad, I was frustrated and I felt underutilized because the role I was in wasn’t challenging. I love working. I love having a career and I have large goals for myself. I’m also a mom. If I’m going to choose to work and be away from my children every day, that time away better be well worth it. And being unhappy, frustrated, and mad was not only unfair to me, it was unfair to my family. I spent much of the last year being mad mostly at myself….why did I make a change so fast? Why can’t I find a way to fix things? It was hard to see, through the frustration and stress that I was in this position and this job for a reason. Seems easy to say now, but it is important for me to remind myself that the journey I am on in life is a purposeful one. Had I not worked here, I would never have been introduced to an organization, CWJC, where I now serve as a mentor to a woman working towards obtaining her GED. I would have not have an education on the inter-workings of a smaller scale franchise operation. I would not have learned what I really want to do with my career moving forward. I would not have met the few people who I hope will actually keep in touch with me:) It was frustrating and crazy, but it was worth it. I’m sad to leave some of my coworkers, but couldn’t be more excited for my next adventure. People, places, things and circumstances are put in your life at a certain time for a very particular reason. It’s never random, and it will always be worth it. I’m a marketer. I’m a food marketer at that, so I get it. The people who CHOOSE to eat diet food are happy to pay a higher price. Now, I could turn this blog into a 4000 word rant on the obesity issue and the cheapness of a quarter pounder, but I’ll refrain. This is more about how I find my way around the high prices, since I didn’t CHOOSE celiac and this food is a necessity. I knew going into this lifestyle change that our grocery bill would increase. I am sure it is more costly for a company to open a certified gluten free facility. I am positive there are fees associated with continuing to be certified, blah blah blah. Long story short, I was prepared for the cost of bread to double. Being prepared doesn’t mean I don’t want to scream every time I open that $5 loaf of bread, only to find half of the slices you would get in a “normal” loaf. And it doesn’t mean I don’t find it SUPER annoying that my people, the genius food marketers of the world, love slapping that $5 price point on the bread bag. This is why I spend most of my time eating gluten free by doing it naturally, and not with gluten free replacements. 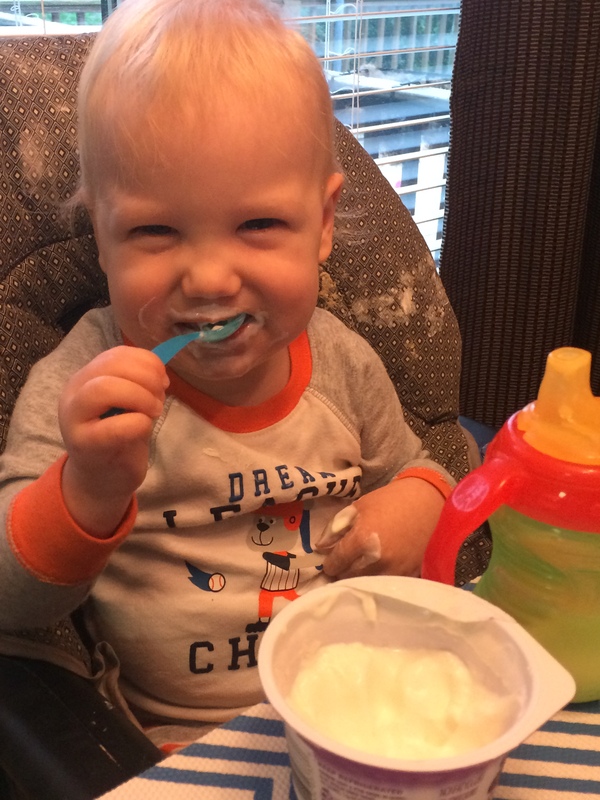 BUT, I dare you to try to pack a 15 month old’s lunch every day with fresh veggies and protein. Every now and then you need a good gluten free cracker and some sunbutter so he doesn’t starve to death. I decided I needed to put my competitive nature to good….to find a way to defeat those sneaky food marketers and get a deal on gluten free goodies. This morning while chatting with my husband I mentioned I needed to find out when Aldi’s opened….he laughed saying he never expected those words to come out of my mouth. I guess I am a stuck up grocery shopper. Or it could be that Aldi’s isn’t nearby, so I go to the store that is close, but let’s stick with the first reason. I’ll admit I’m pretentious. I decided today was the day I was going to give the weird “pay a quarter for a cart” store a try. And I’m so glad I did. The gluten free options, cheeses, produce, and soymilk prices almost made me fall on my face. Yes the store’s display shelves leave something to the imagination, the aisles are narrow, and I had to bag my own groceries. Yes I had to drive past my normal Publix, and another Publix before I could get to the Aldi’s. And I had to insert a quarter to get a cart. But the fact of the matter is, those are the things that help to jack up prices at other grocery store chains. After shopping for about twenty minutes and just finding more and more LiveGFree (the Aldi’s gluten free brand) items to try, we headed to the register. The cashier completed ringing up the ridiculous amount of crackers, frozen items, bread, soymilk, looked up and said “That will be $74.12”. $74. All that for $74. Inside of my loot below is a bag of chocolate covered pretzels, two bags of regular pretzels, frozen ravioli, gluten free pasta, bread, gluten free wraps and two things of milk….not to mention turkey breast, corn, and some fruit. I feel like I pay $74 for milk at Publix. 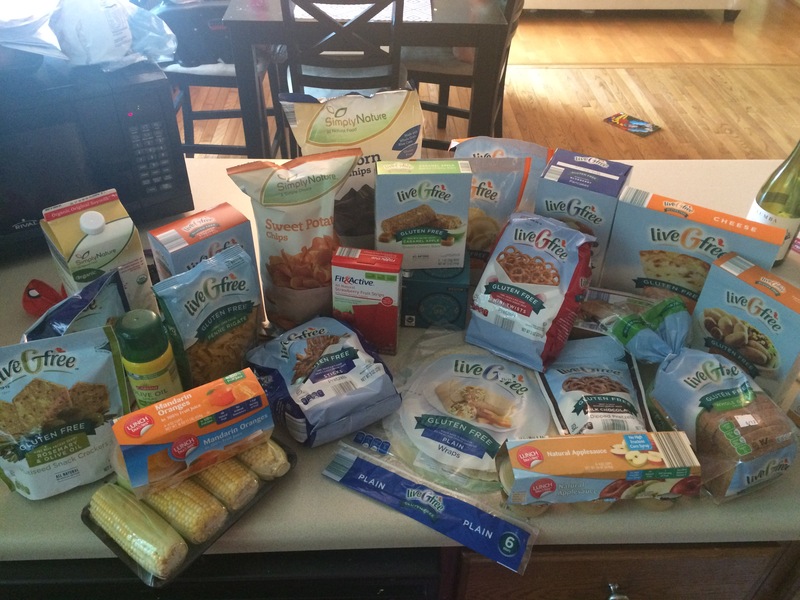 If you need gluten free items, you are crazy not to stop by Aldi’s. It is absolutely worth it. In other news, the Tucker household has been crazy stressful the past few weeks. Nathan was interviewing for a job that would move us to Charlotte, and at the same time I had been approached about a Director of Marketing position with a national bakery chain based in Nashville. Thinking about moving had sent me down the crazy river, and I’m going to guess on several occasions Nathan thought moving without me sounded better than ever;) In the end, the Charlotte move didn’t work out. And you are reading the musings of the new Director of Marketing of a brand I’ll talk about soon;) The best part…they sell gluten free items. My mom said when they diagnosed Pierce that somehow gluten free would be a part of my next career move. She might be a prophet! Pierce continues to get better, which allows my crazy to shift to things like freaking out about moving:) He is walking, blabbering all day, and his appetite is out of control. Can you imagine how good food must taste now that it doesn’t make him sick every time?